Bowls can be glass, ceramic, polished metal or silver-coated. They are used for bread rolls, salads, dressings and condiments. Different shapes and sizes are used to break up the setup of the the buffet and provide focus points. Bowls are sometimes set into folded serviettes for decorative purposes. Bowls should always have an appropriate serving tool nearby. 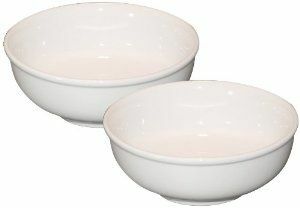 Individual portion-sized bowls may be used when serving soups or wet dishes.